More Russia feedback… grammatical nits to pick… the truth that slipped through the mainstream filters… and more! We’re hard-pressed to think of a better example of how the system is rigged against the little guy. In this case, that means you — the retail investor. Well, maybe there are better examples. But what’s on our mind today is surely the most recent. If you own stocks or other assets in a taxable account, this affects you. Let’s say you own 50 shares of XYZ Corp. You bought 25 of those shares in 2012 for $50 each. You bought the other 25 of those shares in 2015 for $100 each. The current share price of XYZ is $80. Now let’s say you want to raise a little cash to help finance a child or grandchild’s college education… and you want to part with some but not all of your XYZ shares. Under present tax law, you can opt to sell the shares you bought in 2015. By doing so, you pocket the cash and you book a capital loss — which helps lower your tax bill. Under the Senate version of “tax reform,” this handy provision of the tax code goes bye-bye. That is, you’d have to sell the shares you acquired first — in this case, the ones that show a profit. You’d have to book a capital gain, and pay capital gains taxes. That’s outrageous enough. But get this: The original version of the Senate bill applied this change both to individual investors and to mutual fund companies. By the time the bill passed the Senate Finance Committee last Thursday, however, an exception had been carved out for the big boys. “Senators exempted fund firms after some of the largest ones, including Vanguard Group and Eaton Vance Corp., protested,” says The Wall Street Journal. If you’re looking for someone to blame, the measure passed the Senate Finance Committee on a party-line vote — all 14 Republicans voting in favor. Of course, the Democrats had their own reasons to vote against it, and they had nothing to do with this obscure provision. No one’s looking out for you. We don’t like it any more than you do. But we strongly suggest you save your breath calling Capitol Hill to register your protest. A far more productive course of action, we’d suggest, is to shift your investment strategy in line with Washington policy — the old saw about how you can’t change the wind, but you can adjust your sails. Our favorite play on “tax reform” gives you a shot at the kind of gains typically limited to powerful institutions with armies of lobbyists on speed dial. And for maximum payoff, you’ll want to act today. To the markets, where there’s a muted reaction to what the BBC calls “an unprecedented political crisis” in postwar Germany — the dominant power in 21st century Europe. Since elections two months ago, Chancellor Angela Merkel has struggled mightily to form a governing coalition. Yesterday, the party that appeared to be her most likely partner walked out of talks. The next step might be another election; Merkel might soon be history after 12 years in power. The euro is down, but not dramatically: At last check it had shed less than a half percent to $1.174. But other currencies are gaining ground against the greenback; thus the U.S. dollar index is nearly ruler-flat at 94. Heck, Germany’s major stock index, the DAX, ended the day up nearly two-thirds of a percent — in contrast to losses in France and Great Britain. Here in the United States, the major indexes are all in the green — the Dow up strongest by a third of a percent at 23,439. Gold is surrendering much of the ground it gained after we went to virtual press on Friday; the bid is now $1,285. The big economic number of the day is the Conference Board’s leading economic indicators — up a strong 1.2% for October after a nearly-flat September attributed to the hurricanes. Fewer unemployment claims, more building permits and a longer workweek in manufacturing were all positives. “In the long run, I believe the potential for this business is much greater than just legal highs,” writes Ray Blanco with one more dispatch from the Marijuana Business Conference & Expo in Las Vegas. Even before heading out to Vegas, Ray suspected a shift was afoot. Phase 1 of the pot-stock boom was all about the growers and sellers… and the “pick and shovel” plays to support them, like security, grow lights, packaging and processing. Now comes the next phase, he tells us: “Mounting evidence suggests that the cannabis plant’s properties won’t just be wealth creators — they will be health protectors and life extenders. “As we get older, our immune system functions differently. This occurs as pro-inflammatory molecules, called cytokines, are released in greater quantities than when we were young, leading to many age-related inflammatory diseases. “Thanks to past research into the biological properties of cannabis, we’ve discovered a vast molecular signaling network present inside of our bodies,” Ray goes on. “Cannabis compounds are now known to modify the activity of the immune system by interacting with this network. Clinical trials studying cannabinoids in specific health conditions show that it can even have a ‘braking’ effect on the immune system, reducing inflammation. “What we’ve learned from the cannabis plant could one day supply us with the know-how to create powerful anti-inflammatory therapies. By slowing the inflammaging process, we could enjoy longer, healthier life spans. Ray assures us the investment possibilities during this second phase of the pot-stock boom should prove at least as lucrative as during the first. For $49.12? Really? And as we’ve said in years past, where’s the hootch? 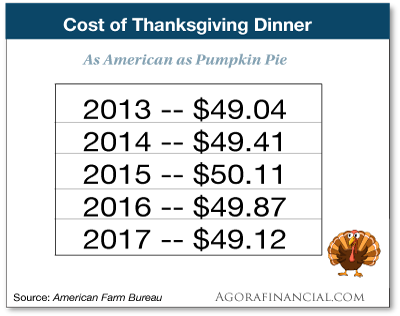 Doing a little mental math here, the cost for all the Thanksgiving fixins’ is down exactly three bits. The price drop is attributed to the cost of wholesale turkey — the lowest it’s been since 2013, at about a dollar per pound. “Just read your item from the 16th about our Russian affairs with respect to Trump,” begins today’s mailbag. “In that article you described some of their recent history with respect to what used to be the Warsaw Pact countries. I couldn’t help noticing the interesting choice of words you used in that piece. The writer said NATO absorbed those countries and later the Baltic states also. “Absorbed!? Is NATO a Borg collective that we absorb countries? Not hardly. “A closer look at those countries will reveal a more interesting story. Between their long and sad history of prior dealings with Russia and then being under the Red heel for most of half a century the only thing they wanted was out. When they finally got out not one of those nations wanted to take any chances on history repeating itself. Therefore NATO membership looked like a really good idea to every one of them. They asked and we took them in. “Dave, here is an even darker side to NATO,” writes another reader with a counterpoint. “My wife is Bosnian. We have been together for 17 years. She, unlike most Bosnian immigrants in America, spent the entire war in country (in Sarajevo and Gorazde). There are few people I know who could handle the details of the stories I have been told over the years. “The thought of a civilian population, spending four years under attack from a fully equipped military in Europe, without any serious UN, U.S. or NATO intervention stymied me. What were the insiders after? Gold, uranium, oil, what? “Just recently the pieces finally came together. The great prize for the largely unnoticed deaths of 300,000 civilians in Europe: a critically located NATO air base. Tuzla was the hub for Tito’s air force. Now it is controlled by NATO. Dust off your old maps and ponder its location. Enough said. “There may have been an extra little perk in this acquisition for Angela Merkel. She was able to break Bosnia, something the Fuhrer was unable to accomplish. Bosnia was the only part of Yugoslavia Tito and his Partisans were able to keep and the only place in Europe Hitler was unable to take (and thus he was unable to connect his southern holdings with Europe). Of course, Angela had a little extra insider help. “Simply put, don’t **** with NATO. “Totally agree with you,” says another reader. “And my list of composers doesn’t stop with Rachmaninoff. “I encourage him to conduct a severe ‘re-education’ class for anyone who imposes ‘till’ ( a cash or register) on him or us when what they mean is ’til (abbreviated form of ‘until’). The 5: Hmmm… Language is an ever-evolving thing and we’re not averse to “till.” Nor, for that matter, is my 1985 vintage American Heritage Dictionary, which doesn’t slap that usage of “till” with the nonstandard designation. “Americans don’t like rich folks,” says the subject line of another reader email — which happens to have been part of a line from Friday’s 5. 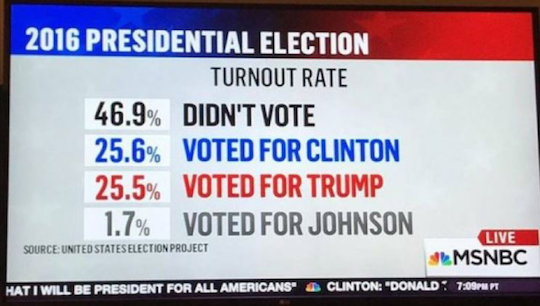 Talk about your silent majority. Or, to be precise with our language, a large silent plurality. But here’s another important point: We targeted our ire at “rich people who show off,” e.g. Treasury Secretary Steve Mnuchin and his Hollywood wife Louise Linton. P.S. Another one-week wonder: Last Monday, Alan Knuckman recommended call options on the semiconductor maker Micron. This morning, he urged readers to take profits of 50%. Earlier today, you might have gotten an email saying your account with us has possibly been flagged. If you didn’t click on the link, it explained how you could have access to trades just like these — week after week. This opportunity is available for only a few more hours — details here.